Hi there! 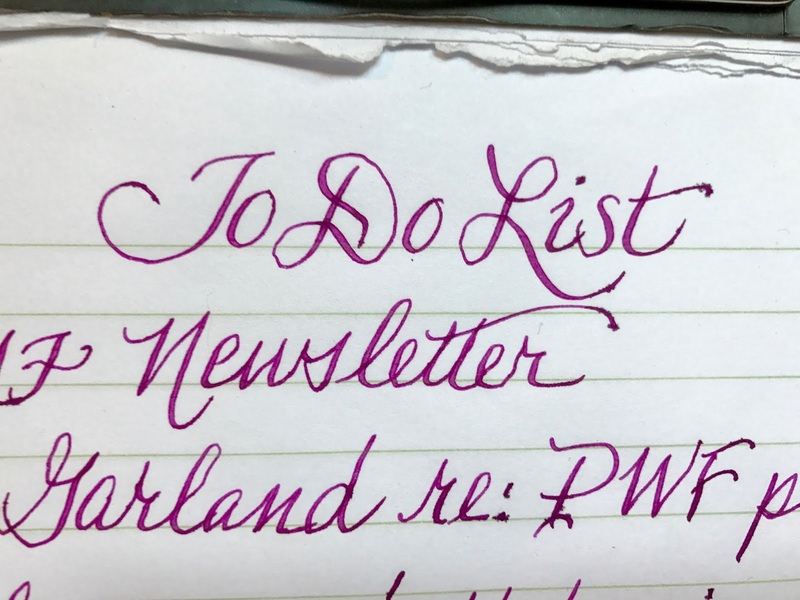 My younger sister Denise ran across a video showing a person using a soft flex pen nib and I got excited about it. I've been fascinated by Spencerian Script writing for many years but never had a pen that flexed easily to get the thick and thin line of Spencerian writing. I scanned the comments under the video and the man who did it shared the pen he used. I ordered one from Amazon and have been experimenting with it for a few days. Click HERE to view the video. 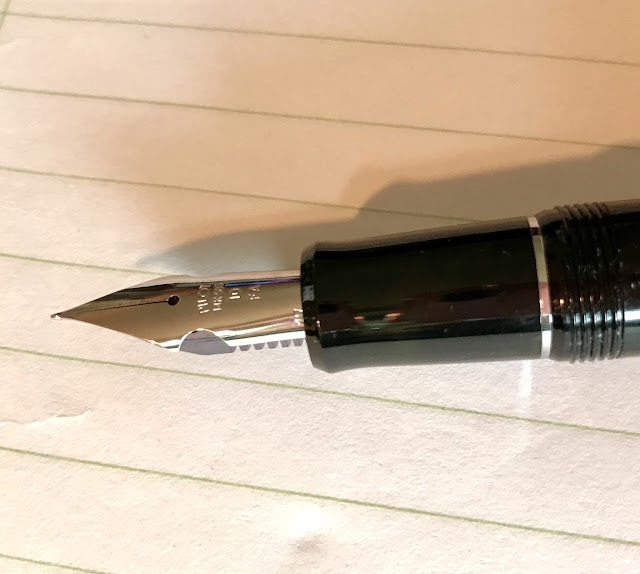 The nib on the Pilot Fountain Pen, Custom Heritage 91 SF-Nib. I got my old leather journal that I'd inserted a brand new journal book and did some writing. I'll always treasure this book as it was a gift from my two sisters and my mother when she was still active before she passed away and we were shopping together at a fun mall in an old building called John's Landing. I'd admired the journal in a shop and they snuck back and bought it for me.. one of my best gifts ever. The pen is giving me a bit of trouble when I press down for the thick line but I believe it just needs broken in a bit. The nib spreads and you get two lines, which is called "railroading". I tried to fill it in but it doesn't look nice.. I hope it straightens out. Hayden is going to take up violin in the school strings group, I'm so excited for him and hope he does well. Another swim to enjoy - go you - I don't know how you fit it all in! Your writing is absolutely beautiful. My hand writing is appalling although I guess if I had the right pen I might try a bit harder! Good luck to Hayden. I love the violin and cello. We don't have strings here in our school system, and I think that is such a shame. LOVE the new pen. First of all, I love the photo of Hayden With his new violin. He looks well pleased. 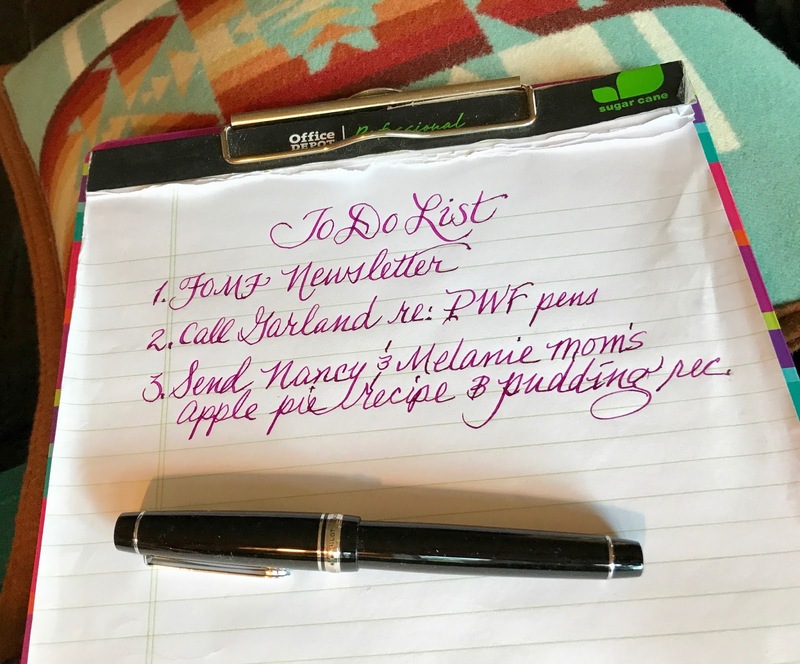 The writing with your new pan looks a lot like the way my mother used to write. She had beautiful penmanship. We don't teach that to our children anymore and I fear it's becoming a lost art. I'm so glad Gracie is back and you two can get together and go swimming again. Give her a hug for me next time you see her. I could listen to beautiful violin music all day long. I do hope Hayden enjoys learning. Great pen, the fellow in the video makes it look so effortless. What a treasure to remember your Mom & sisters. Your penmanship is beautiful. Hope Hayden enjoys learning the violin, my three daughters all play and still enjoy it. A lovely gift with such wonderful memories. Your writing is beautiful and so is the journal. I started to write in the back of my planner. Thoughts. Things that happened during the year I wanted to elaborate on a bit. Hope Hayden enjoys playing the violin. Play on young man. I do like the beginnings of your 'bucket list'. Does it make it more achievable by writing it in such a fancy script?! I'm wishing Hayden good luck with the violin. 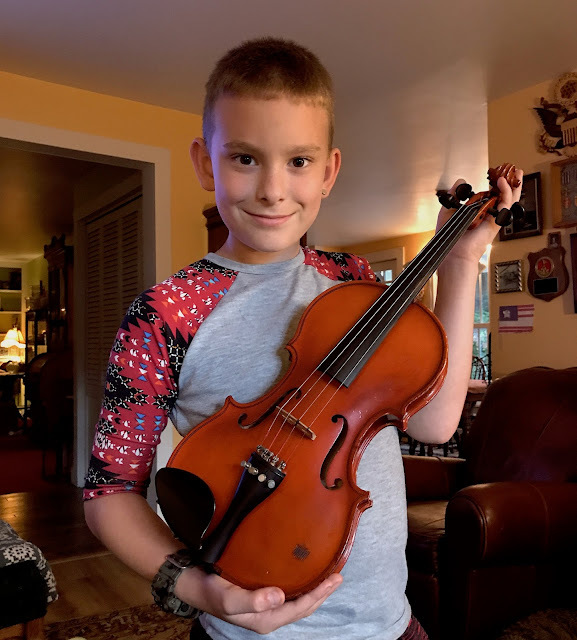 My older daughter is very musical and plays in several (our county-level) orchestras, so if he shows promise/talent then encourage him as I know that for my daughter (who isn't the most social of children) having a shared interest has opened up a whole new friendship base. She's also, through membership of these orchestras, been abroad to The Netherlands, France, Hungary and Portugal, playing concerts in various European cities and having a wonderful time. Ooh, calligraphy is so fascinating. I hadn't heard of Spenserian writing - does it refer back to Edmund Spenser? Your samples look lovely. 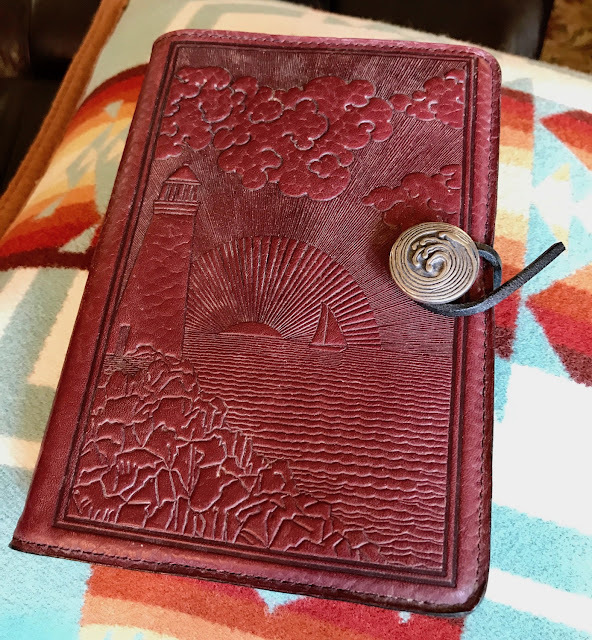 That journal is gorgeous. How fun to have a budding violinist in the family. Your writing is beautiful and it looks like you've done it for years. 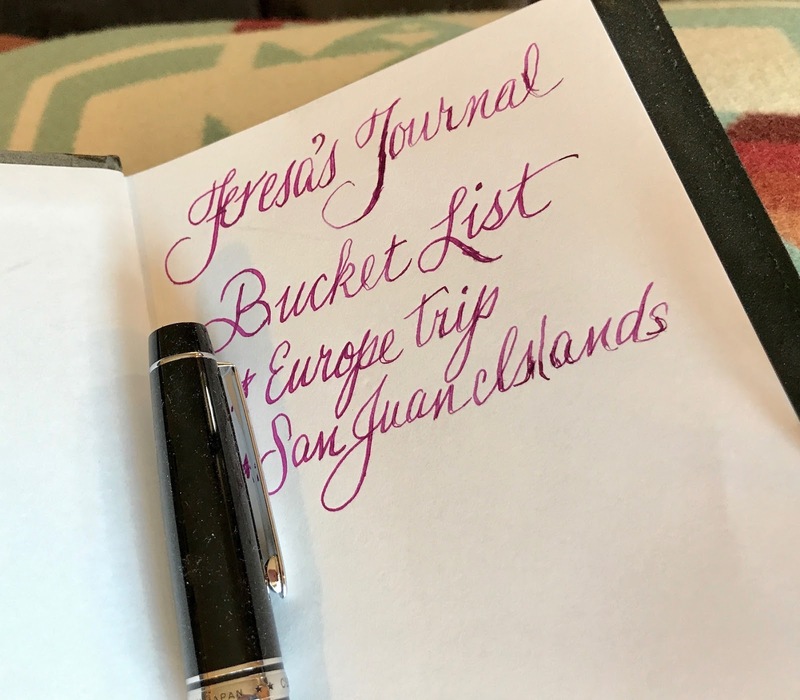 What a fun addition to your nice journal, too. Has the cooler weather and rain helped the fires down your way? I surely hope so! Hugs! This is terrific - I am inspired to take a calligraphy class!